What’s your idea of a perfect night out? For a lot of people it involves dinner, drinks and some kind of entertainment. The Park, a new outdoor pedestrian district on the Strip, opening April 4, is making it easy for you to roll all of those things into one. The Park will combine outdoor space with restaurants, bars and a new arena. 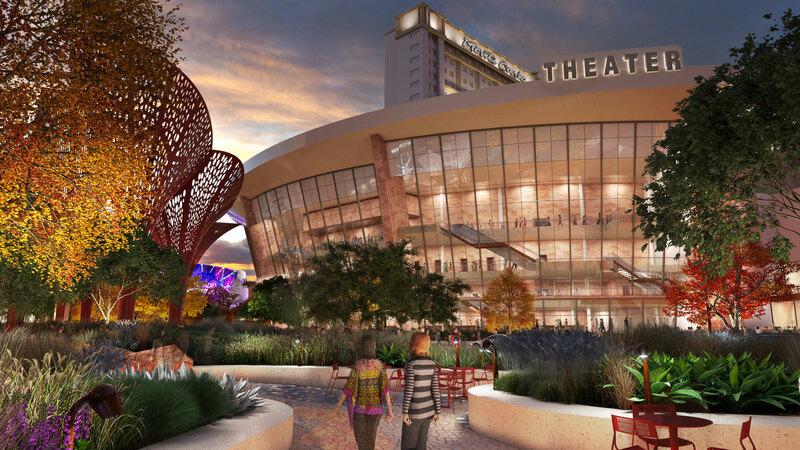 Rendering courtesy of MGM Resorts International. 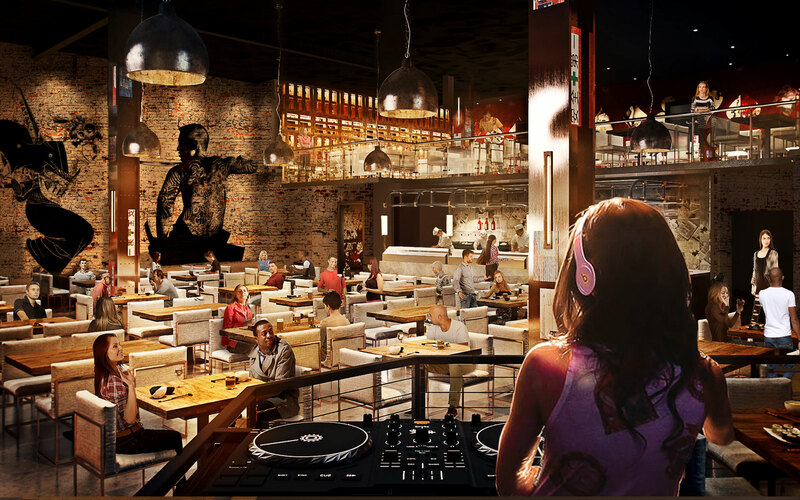 Sake Rok will feature a mix of dining and entertainment. Rendering courtesy of Sake Rok. Inspired by Japan’s pop culture and fashion scene, Sake Rok will offer an innovative menu of Japanese and Japanese-American fusion dishes. At night, Sake Rok will transform into a social dining extravaganza, giving guests an experience that’s part culinary and part performance. An outlandish master of ceremonies will keep the energy flowing, while interactive servers doubling as entertainers invite guests to partake in restaurant-wide sake bombs, dance parties and lip-sync serenades. 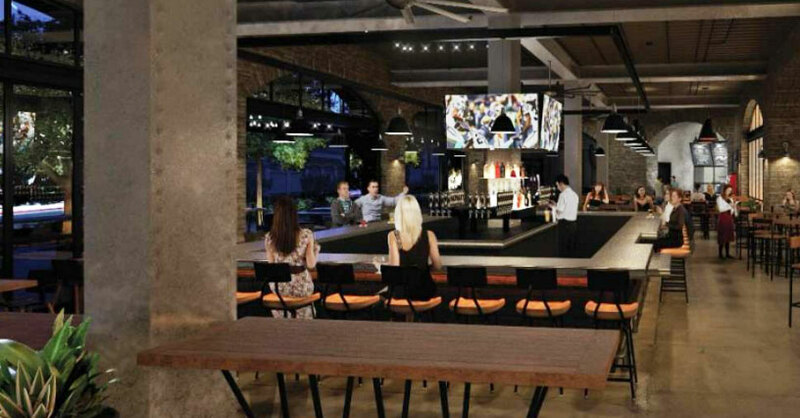 In addition to the first floor bar, dining room and sushi bar, Sake Rok will offer a mezzanine that overlooks the main dining room as well as a private event space, dubbed “Sakura Terrace at The Park,” which will seat 150 and open up to a 1,300-square-foot balcony with sweeping views of T-Mobile Arena and the Las Vegas Strip. Beerhaus will be a great place to grab a brew before a show at T-Mobile Arena. Rendering courtesy of Beerhaus. Beer lovers, rejoice! The Park will also be home to Beerhaus, an American beer hall with an eclectic beer program for both casual drinkers and those who are a little more obsessed with the brews. Beerhaus will boast pours from Vegas-local breweries such as Joseph James, alongside domestic crafts and international favorites. The selection includes lagers such as The Bruery Humulus Lager from California, and Joseph James’ American Light Lager. Off draft, choices range from the gluten-free Green’s Dry Hopped imported from the UK and the Ayinger Celebrator from Germany, to ales such as Hitachino Nest White Ale from Japan and Belgium’s Saison DuPont. You’ll be able to enjoy your beer on an outdoor patio and pair it with a bunch of bites that are regionally sourced. Bar food will include things like roasted sausages and rotisserie sandwiches with premium meats such as porchetta, beef brisket and free-range chicken. For fun, guests can play bar games such as Connect Four, which are stationed at every table. You can also engage in friendly competition with beer hall classics such as foosball, corn hole, shuffle board and ping pong. The popular California Pizza Kitchen will also set up shop at The Park. CPK offers signature hand-tossed, hearth-baked pizzas, pastas and salads, alongside premium wines, craft beers and hand-crafted cocktails. With an outdoor patio, CPK will be perfect for drinks and small plates before a show. If you like waffles, (and let’s face it, who doesn’t?) you’ll love Bruxie, a restaurant that uses authentic Belgian waffles as the bread in its sandwiches. The waffle is not super sweet so it makes for a tasty sandwich. Sandwich choices include things like pulled pork and Buffalo bleu chicken. There are also salads served with a waffle crisp and of course, waffle fries. For breakfast you can find sausage and egg dishes and green eggs and ham. For those with a sweet tooth, there are plenty of sweet waffle treats including Nutella and banana, lemon cream and berries and Belgian chocolate s’mores. The traditional Belgian waffles can be topped with Belgian chocolate, maple syrup and cinnamon sugar. 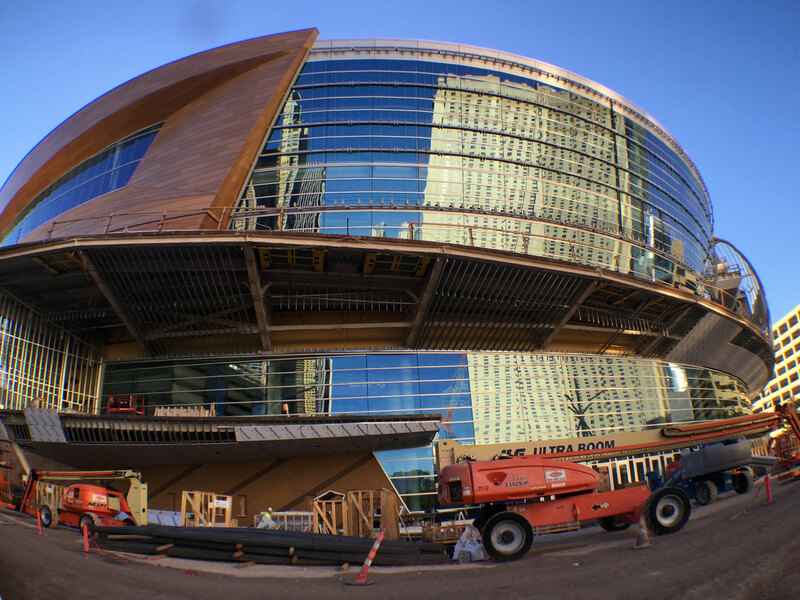 The new 20,000-seat T-Mobile Arena, photo courtesy of Vegas.com. If you’re at the new arena for a show and you need a snack, there will be plenty of options inside the venue. Shake Shack has announced it will set up a branch at the arena that will serve a smaller version of the restaurant’s menu. (Don’t worry – you can get the full menu at the nearby New York- New York location.) Customer favorites like the Shack Burger, Shack Stack, hot dogs and chicken dogs, custard scoops and fries will be available at the arena. Shake Shack will join local restaurant Ferraro’s Pizza Forte, which will also open a restaurant inside the arena. There will also be customized concessions inside. Menus will change to anticipate fan tastes. You might find everything from hand-carved pork hoisin bahn mi to a made-to-order ahi tuna poke bar. Club lounges will feature things like craft beer, duck fat frites and artisanal charcuterie.